Intensity: Alternate hard days with easy days. Allow your body to recover from the hard efforts. On hard days you may only ride half the distance you would ride on an easy day. Alternating intensity not only allows you to be able to sustain hard efforts (like riding all day into a headwind), but also changes the monotony of riding the same speed/distance day in and day out. Warm-up: Use the first few miles of every ride as a warm-up. Especially when it’s cool out, this will minimize the chances of injury. 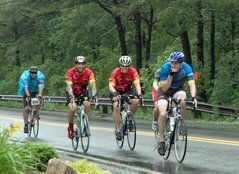 Many people make the mistake of pushing too hard early in the season when they are both not in shape and riding in cool/cold weather. Stretching: Stretching before you ride can prevent injury, while stretching after you ride can aid the recovery process – especially on a two day ride. Stretch until you feel the pull, then back off slightly. Pain while stretching means you are overdoing it. Remember long (at least 30 seconds) and slow. Find a Buddy or Two: Riding is MUCH more fund with a friend. It also adds to the safety and a buddy will be there to help out if you have a puncture or a mechanical problem. Clothing: Don't under-dress for cool conditions. Dress in layers. Tendons and ligaments work best when warm. Wear leg warmers until it reaches about 60 F. It may look cool to have bare legs at 55 F, however you run the risk of injury. You can always take off layers if you are too hot, but can’t put them on if you find yourself too cold and didn’t bring them with you.